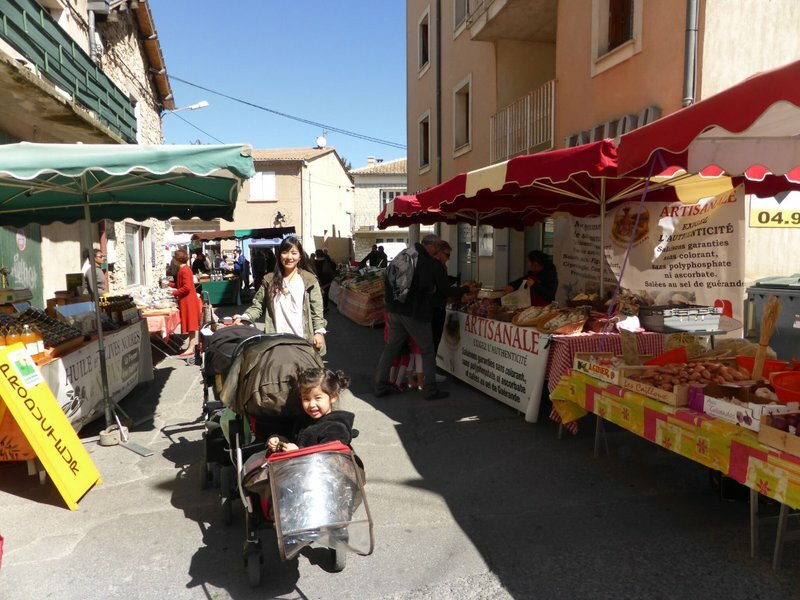 Tuesday's market was in Vaison-la-Romaine, not far from the area we had covered the previous day. 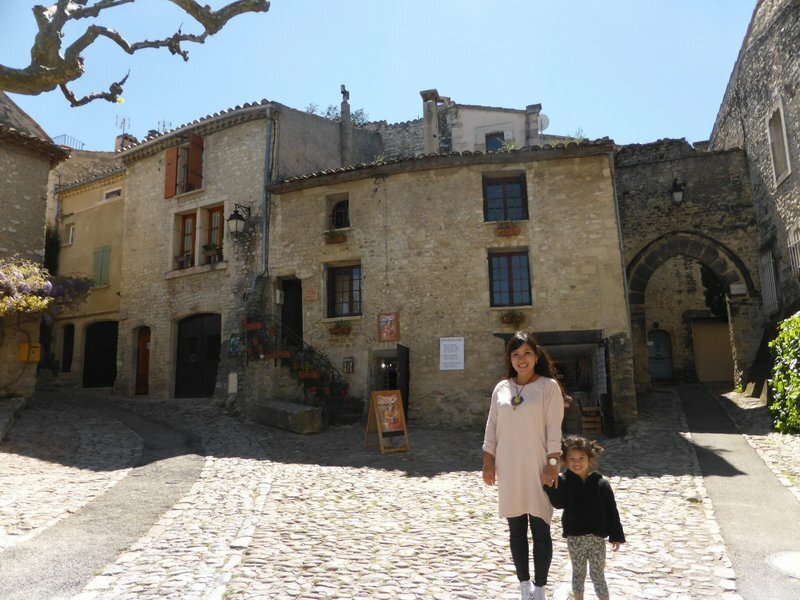 This pretty town spans both banks of the river Ouvèze, and contains some well-preserved Roman ruins. 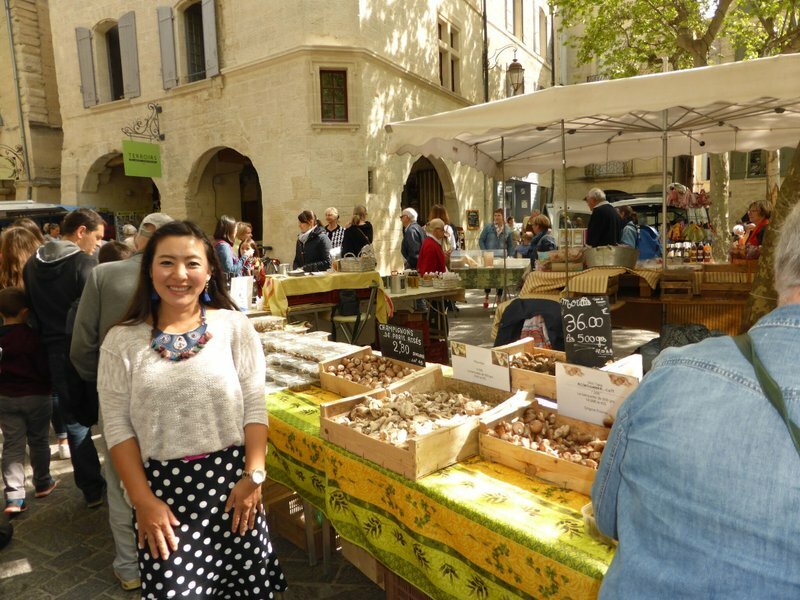 The market was in the modern town on the northern bank and sprawled down several side streets so that even after two hours we weren't sure we had seen everything. 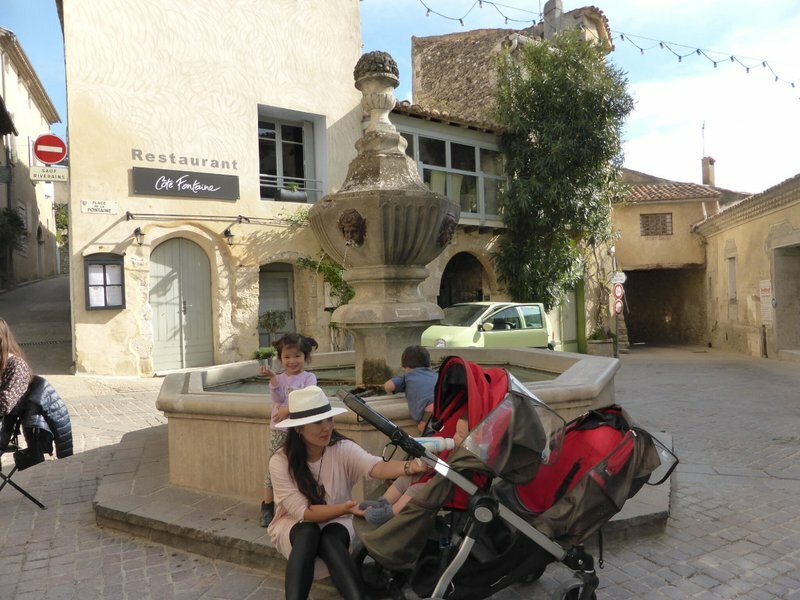 We crossed an ancient bridge to the old town, known as the Cité Médiévale, where we were greeted with the familiar sight of a steep cobblestone road heading uphill. 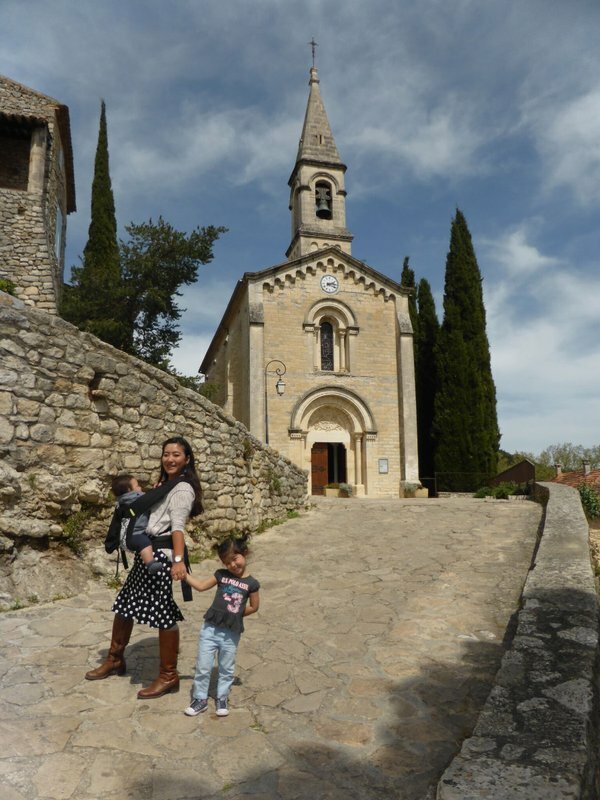 We pressed ahead but were stopped short of the hilltop château and its vaunted views as the road turned into a rocky dirt path that would have been decidedly unfriendly to our strollers. 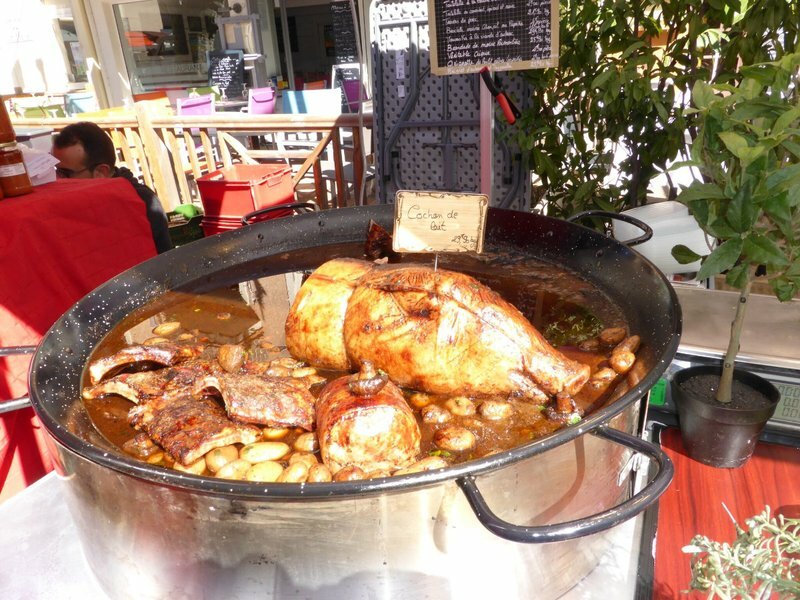 Instead we elected to have a very good lunch on the outdoor patio of La Fête en Provence. The road took us all the way to the top of the hill at our next stop, Venasque, which spared us from having to use all our newly-acquired calories to push the strollers. 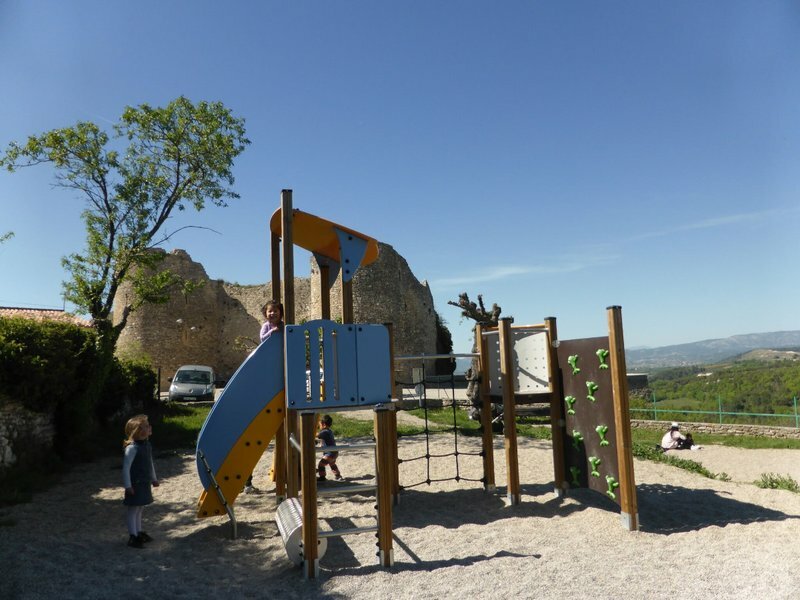 The kids arose from their naps just in time to blow off some energy at a pretty playground just outside the walls of the old town. Inside the walls, there were only a few streets to explore. The ancient houses were draped in vines and wisteria. 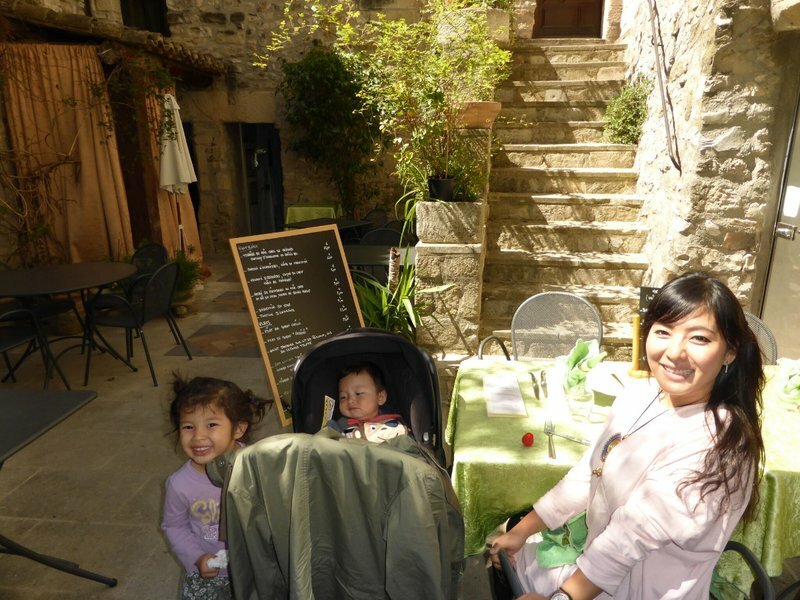 We found a small cafe in the central square where we enjoyed some of the local specialty, cherry juice. 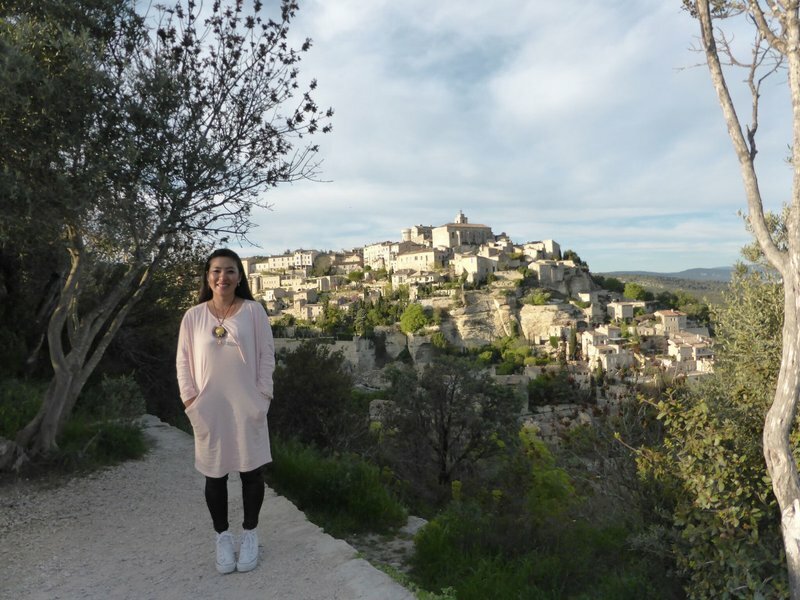 Our last stop of the day before dinner was Gordes, the town we had fallen short of two days earlier. 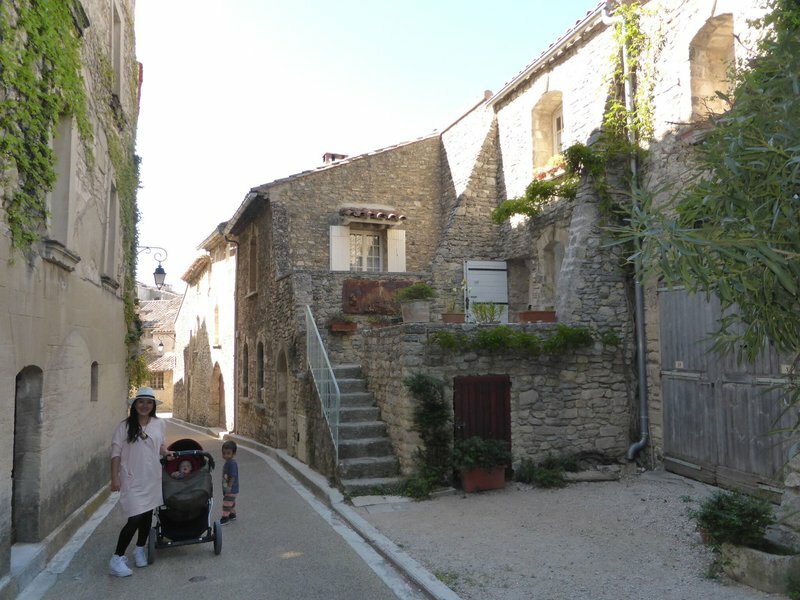 Most of Gordes spills down a hillside and the old town is filled with staircases, so the strollers limited the amount of exploration we could accomplish. 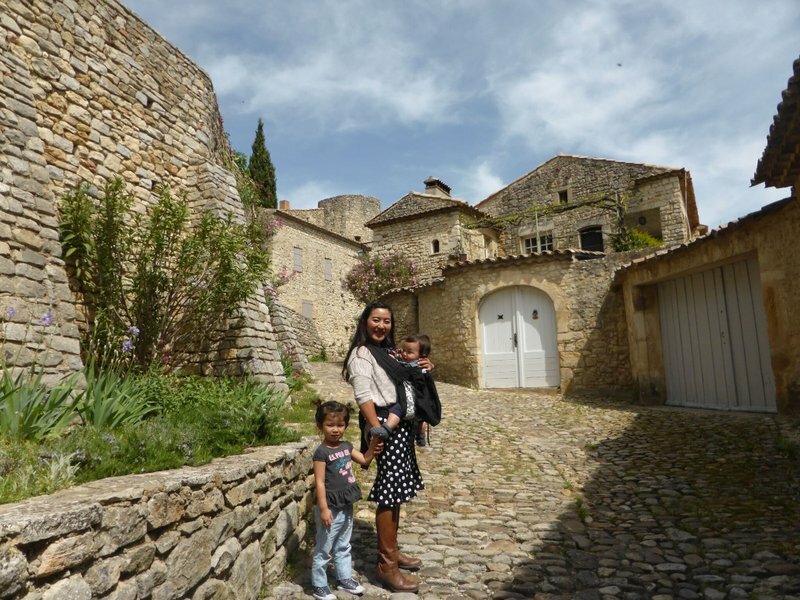 We satisfied ourselves by walking around the imposing 16th century castle and a few side streets. On the way out of town was a roadside vantage point with a great view of the town. 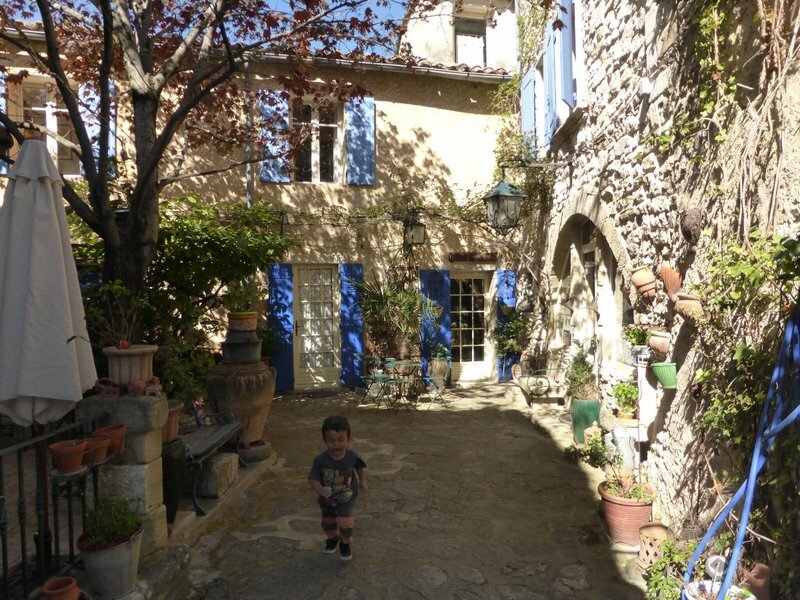 I mulled over dinner choices for a while, mainly using TripAdvisor, and eventually settled on Le Carré d'Herbes back in L'Isle sur la Sorgue. 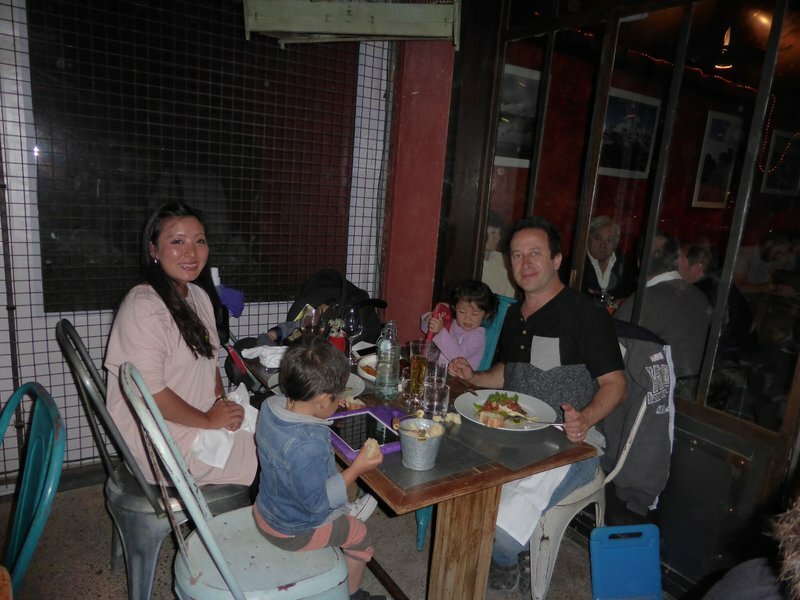 We enjoyed revisiting the lovely river town in the quiet late afternoon without the mobs of market shoppers, and the dinner was one of the ten best of our trip. We got turned around leaving the restaurant in the darkness and had to walk three quarters of the way around the island to find the Iceberg. It was late once we got back and I decided to look for a parking spot outside our building. Surprisingly, I found one that was just large enough for the van and a friendly guy on the street helped me back in. Unfortunately during one of the many switches between going forward and reversing into the spot, I stepped on the wrong pedal and backed the Iceberg into the corner of a metal barricade. I was rewarded with the loud crack of a plastic brake light housing. Once parked, I inspected the damage and convinced myself that the rental company might not notice the crack when I dropped off the van. As I carried Ian across the street he pointed at the van and exclaimed in a horrified voice "Look! Broken!" 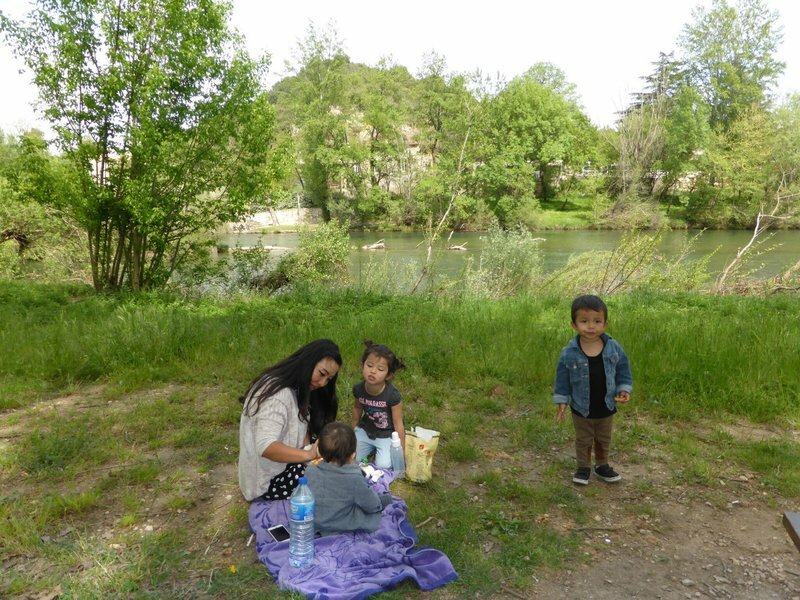 In spite of the sour ending, our fourth day in the Avignon area had been a solid success. 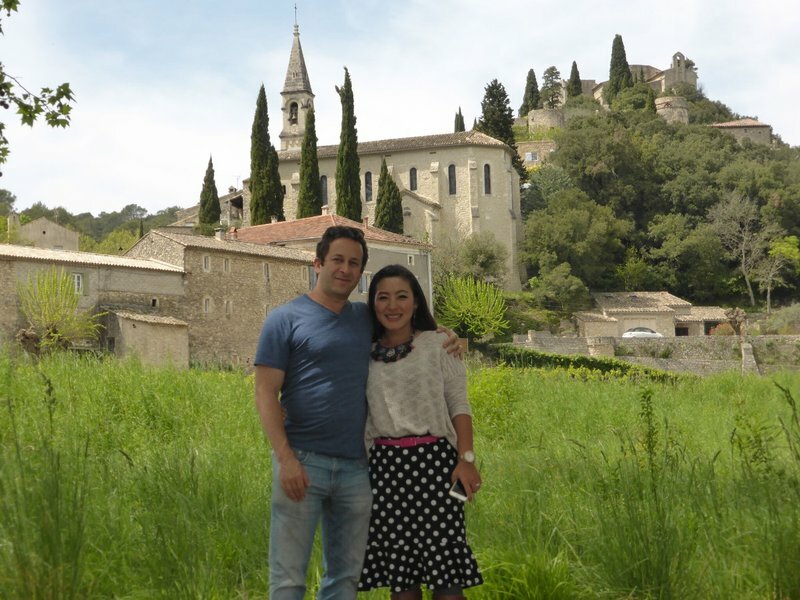 The next day we headed west across the Rhone and back into Languedoc. 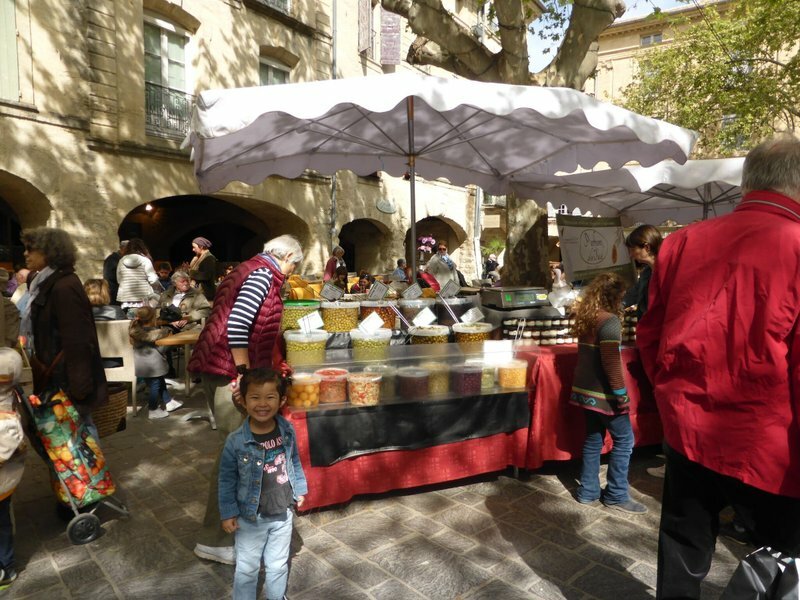 The Wednesday market in the medieval town of Uzès occupied a spacious central square, which made it easier to navigate with the strollers. 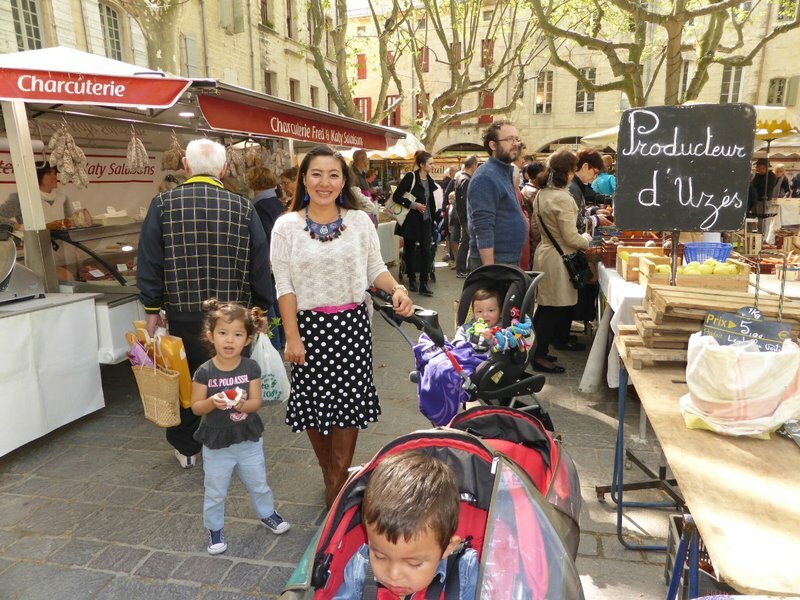 It was one of the better markets we had been to for cheese and fruits, as well as gourmet delicacies. 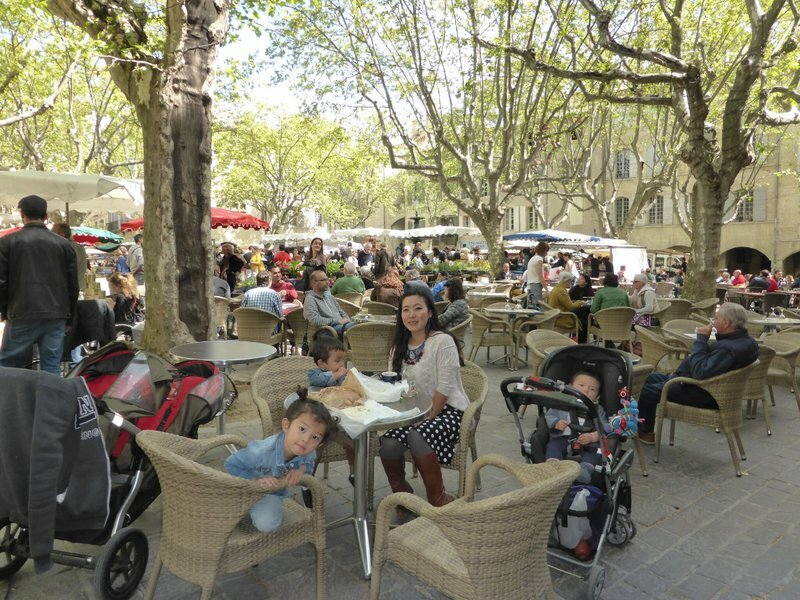 There were also plenty of sidewalk cafes, and we were able to self-cater a late breakfast from the market with drinks at a cafe. 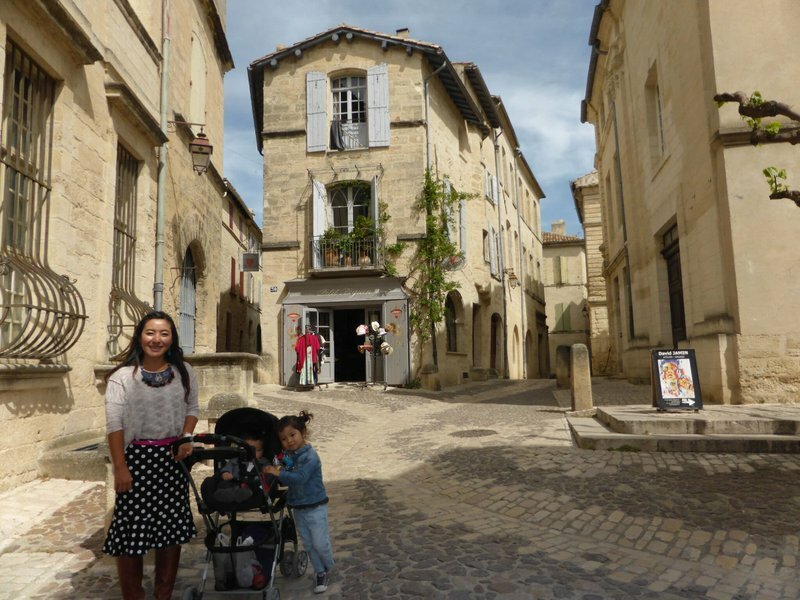 Uzès was a pleasant town to explore as well, with smooth cobblestone streets winding between ancient buildings of beige sandstone. 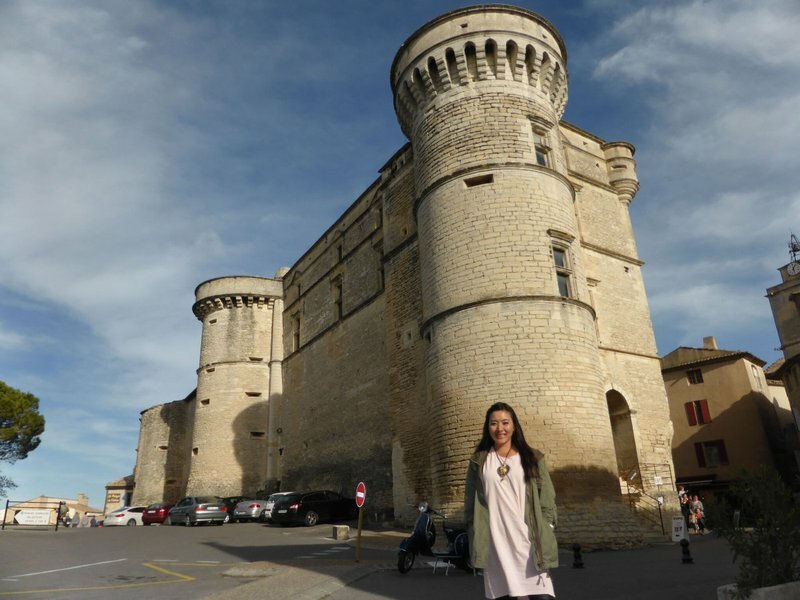 Outside of the town's castle, Le Duché, Cleo suddenly announced she had to pee. Not seeing any cafes or other obvious bathroom locations nearby, Mei Ling took Cleo behind a parked car. Cleo doesn't control her bladder very well yet. The proprietress of a flower shop overheard us discussing the plan and came over to take us to task for letting Cleo pee in the street. Then she made a big show of coming out with a bucket of water and pouring it over Cleo's little puddle, ignoring three or four large piles of dog feces on the way. 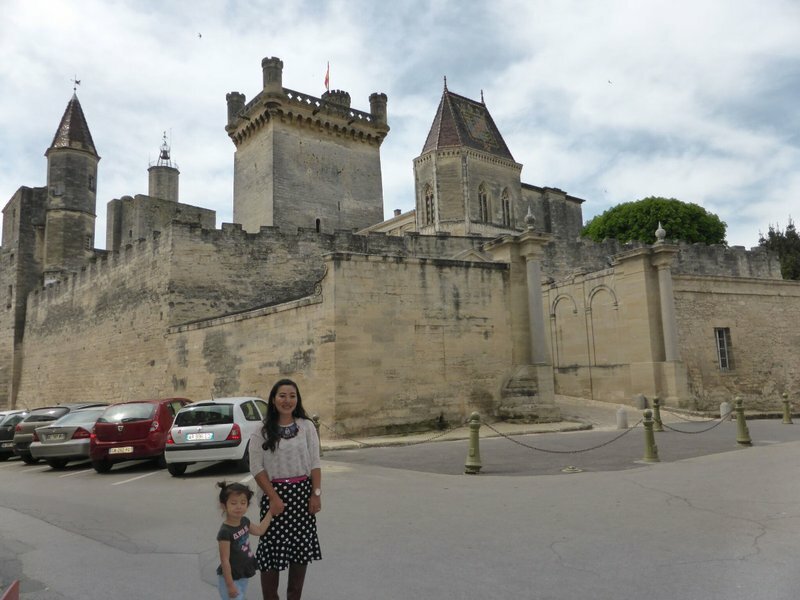 Unfortunately, the highly-recommended medieval garden was closed at the time we were in Uzès. 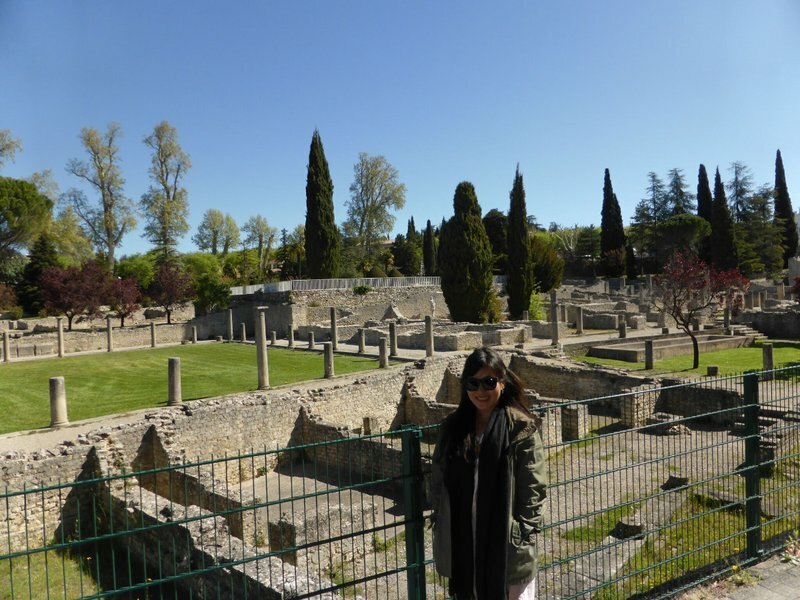 Here's a beautifully written article about the city I came across while doing my research. 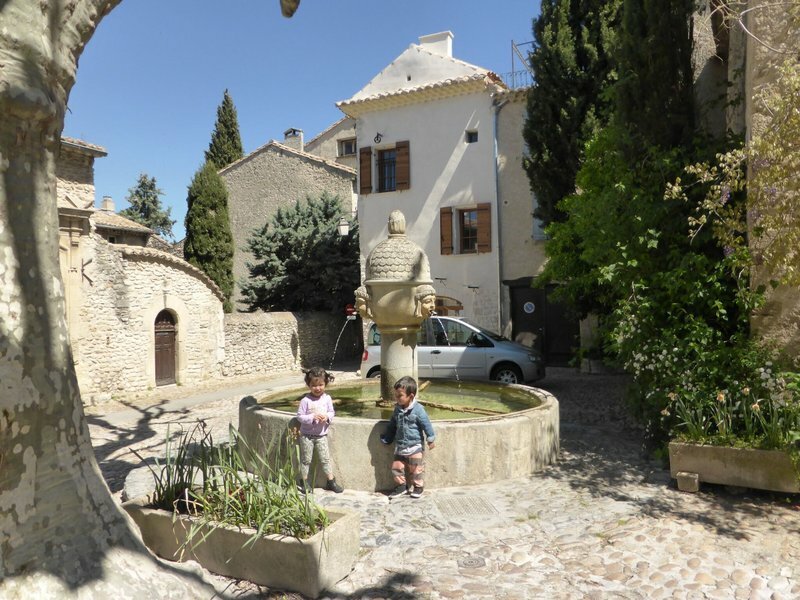 We moved on to another small village with a long name, La Roque-sur-Cèze. 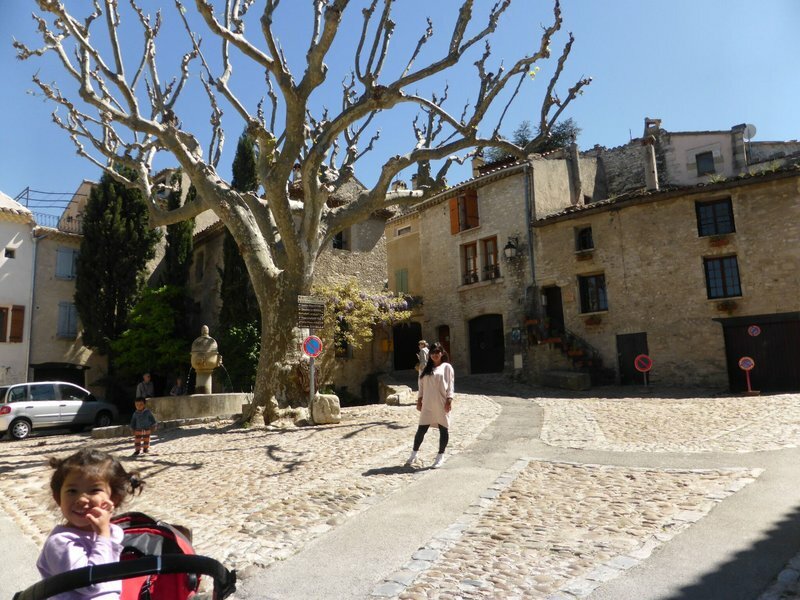 We wisely chose to forgo the strollers and climbed the irregular cobblestones up to the top of the rocky hill the town is perched on. 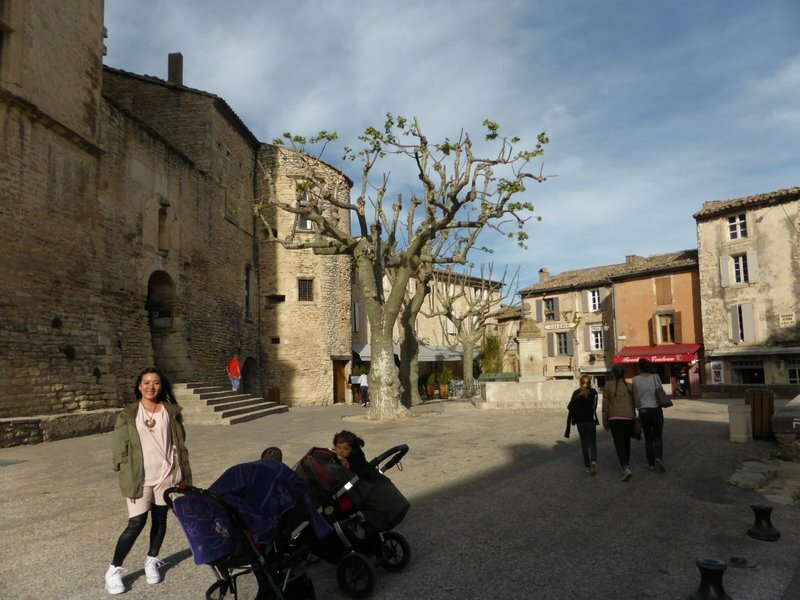 We absorbed the atmosphere and views and then polished off our remaining purchases from the Uzès market at the bank of the Cèze. 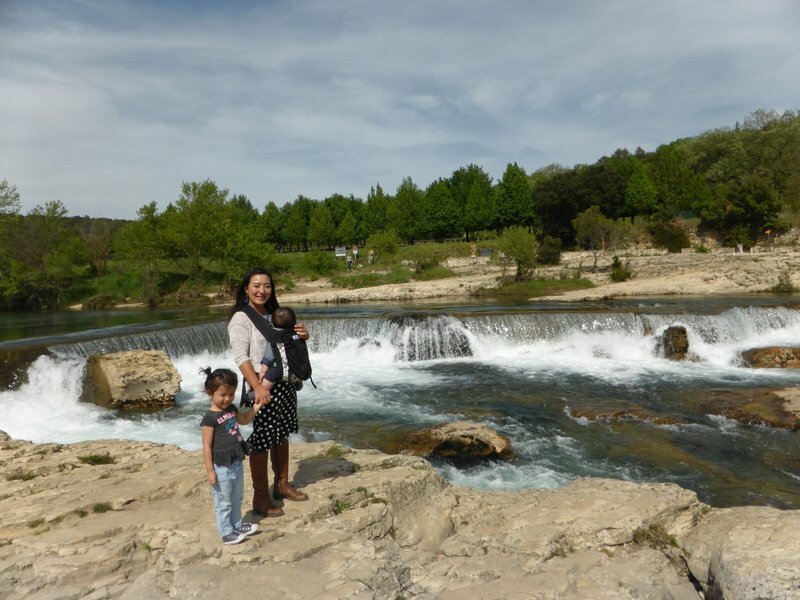 After the picnic we took a fifteen minute walk down a dirt path to Les Cascades du Sautadet, a small area of shallow rapids and dipping pools in the Cèze. The waters have a reputation for being dangerous, so swimming was out of the question. I was so nervous about the kids slipping into one of the many cracks between the rocks I could barely snap a couple of quick pictures. 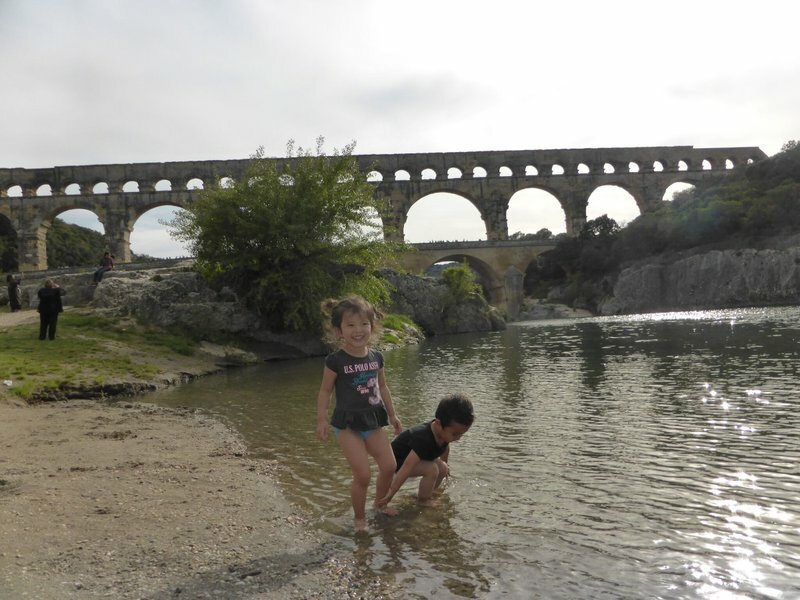 We doubled back to the river Gardon, southeast of Uzès, to explore the enormous Roman aqueduct at Pont du Gard. It's a very touristy spot, with a large visitor center and parking lot set about a fifteen minute walk from the aqueduct itself. The reward for the kids was the chance to wade in the river and toss pebbles in every direction. 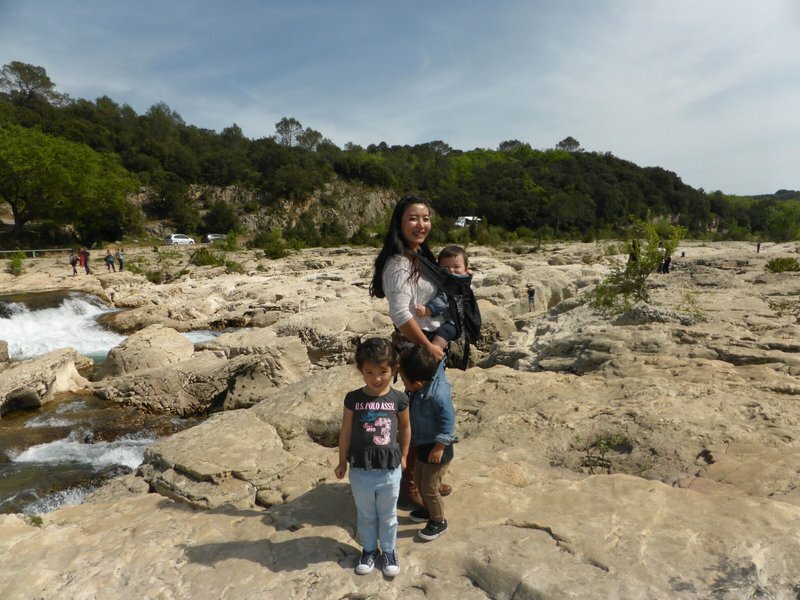 We played around at Pont du Gard for quite a while, so by the time we had changed the kids and gotten back to the car it was already time for dinner. 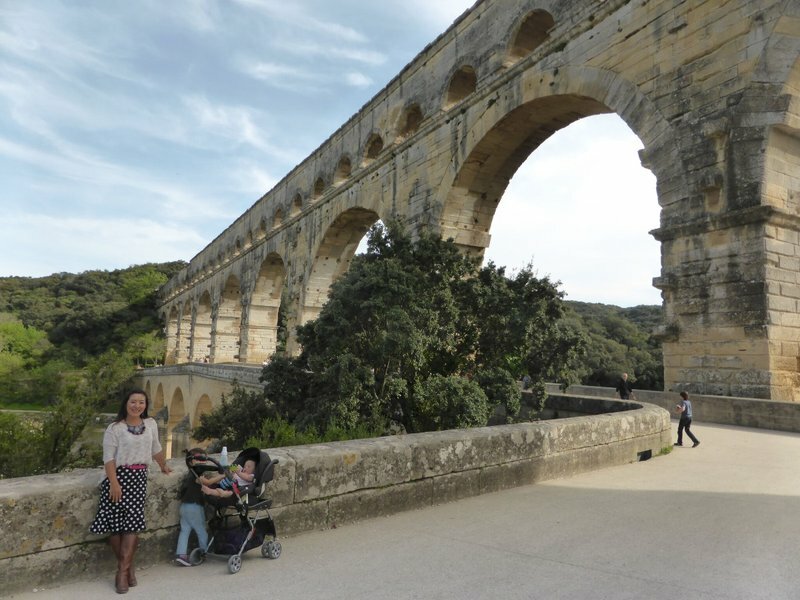 I'd planned to see some of the Roman ruins at Nîmes but by the time we arrived it was dark and we decided to just go ahead and eat. The food at the restaurant we chose was decent but nothing special. At one point I had to lunge for one of the kids who was about to do something unspeakable and my hand slapped Mei Ling's glass, which splattered red wine onto the matte beige wall next to us. Fortunately we saved the glass from falling and the waitress didn't seem to notice the interesting new design on the wall. It was another long day and late night for us in the Avignon area.